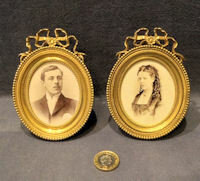 Original, quality pair of late 19th century small oval shaped cast brass photograph frames in the original matt gilt finish and with the original very thin and delicate cushioned glass inserts. This superb pair of frames have seen little use and have very fine detail to the wide and deep frames with a ribbon top mount. 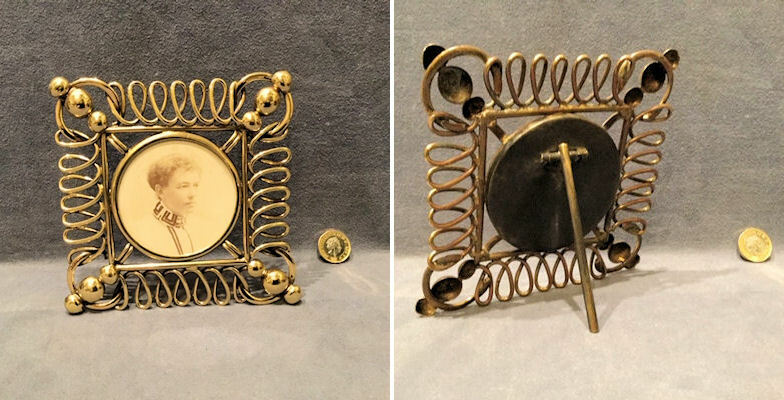 The reverse has an oval sheet brass backplate screwed in position which can be removed to change the photograph and has a folding easel style backstand stamped "Giroux Paris", there is also a decorative ring to the top for wall hanging. Complete and in good and working order. A super pair of most unusual frames in stunning condition. Each 4.25" including top mount x 3" x 0.75" front to back. Visible picture 2.5" x 2". 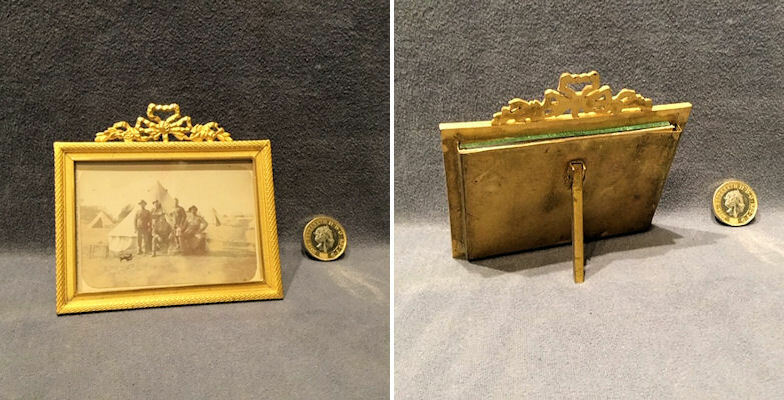 Original, quality 1920's small horizontal rectangular shaped cast brass photograph frame in the original unpolished matt gilt finish. 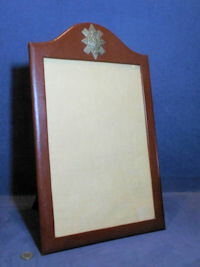 This example has an embossed decorated frame with a ribbon form top mount. The reverse has a slide out backplate with a folding easel type backstand and will take a photograph 3.5" x 2.25". Complete and in good and working order. 4" tall x 3.5" including pediment x 0.75". 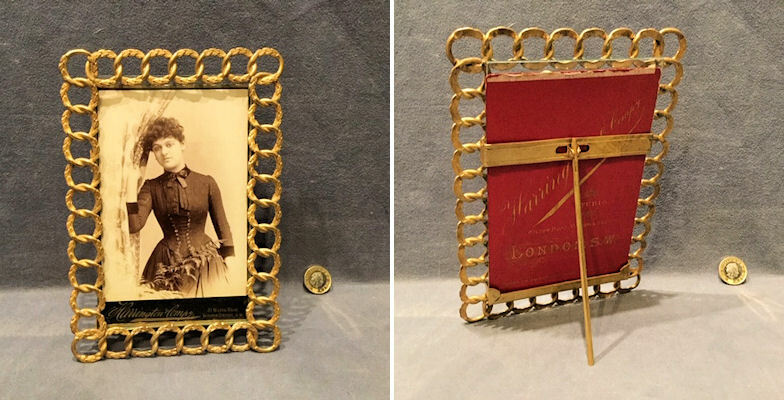 Original, quality 1920's square brass photo frame fashioned in looped over brass rod with a circular central panel for the photograph. The reverse in the unpolished old lacquer finish has an easel type back stand which will fold flat for storage and the front is polished and lacquered, although the lacquer may be removed at no extra cost. The inner panel will take a photograph 2.75" diam. An unusual example complete and in good and working order. 5.5" x 5.5" x 1". 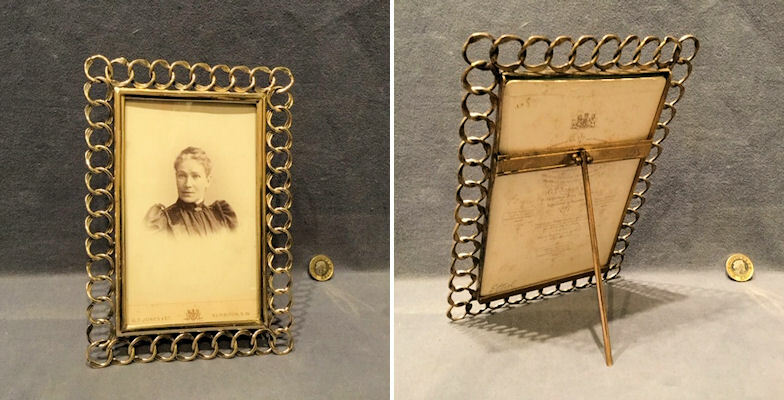 Original, quality late 19th century brass photograph frame with the outer decorative frame fashioned in flattened chains form in the original unpolished matt gilt finish with the vertical rectangular shaped inner frame to take a standard photo 6.5" x 4.25". The reverse in the unpolished old lacquer finish has an easel type backstand which will fold flat for storage. A near unused example. Complete and in good and working order. 8.25" x 5.75" x1" front to back. 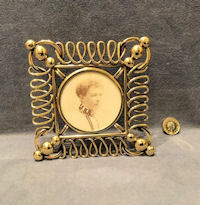 Original, quality late 19th century brass photograph frame with the outer decorative frame fashioned in flattened chains form with the vertical rectangular shaped inner frame to take a standard photo 6.5" x 4.25". The reverse in the unpolished old lacquer finish has a easel type backstand which will fold flat for storage and the front is polished and lacquered, although the lacquer may be removed at no extra cost. A near unused example. Complete and in good and working order. 8.25" x 6" x1" front to back. 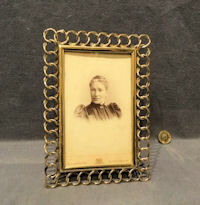 Original, quality late 19th century ornate brass photograph frame of an unusual design. 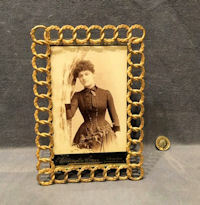 The outer frame is fashioned in a looped flattened brass bar with the vertical rectangular shaped central section to take a 6.5" x 4.25" standard sized photograph. The reverse in the unpolished old lacquer finish has an easel type backstand which will fold flat for storage and the front is polished and lacquered, although the lacquer may be removed at no extra cost. A near unused example. Complete and in good and working order. 10.5" tall x 9" widest, folded flat 1" front to back. 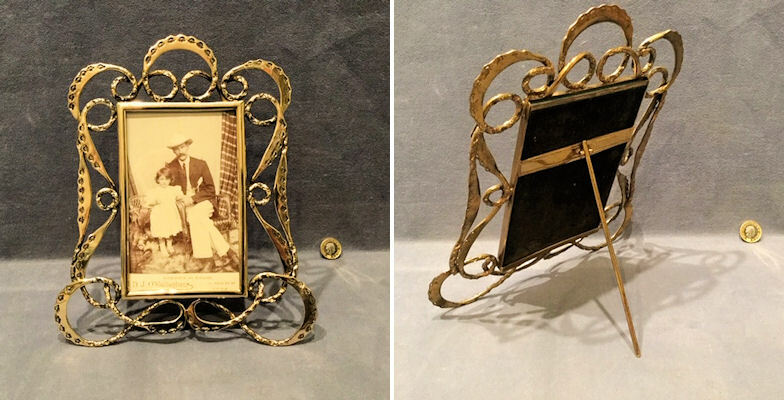 Original, quality 1920's circular cast brass photograph frame with a ribbon twist detail to the front and fold flat easel backstand. The hanging ring to the reverse will unscrew to gain access to the photograph. Will take a photograph 5.5" diam with 4.75" diamvisible. Polished and lacquered, although the lacquer may be removed at no extra cost and complete and in good order. Total 6" diam x 0.5" front to back folded. 3.5" front to back with easel out. 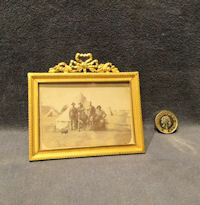 Original, quality late 19th century pierced brass photograph frame, with a fold flat easel backstand. This very detailed example, probably continental, has 'fleur de lis' to each corner and a top mount of a winged figure in armour slaying a dragon. 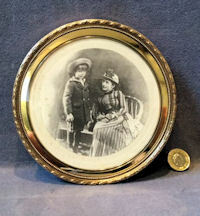 will take a cabinet photo 6.5" x 4.25" with 5.5" x 3.75" visible. Polished and lacquered, although the lacquer may be removed at no extra cost and complete and in good order. Total 9.25" x 5.5" and 0.5" front to back folded flat. 2.5" front to back with easel out. 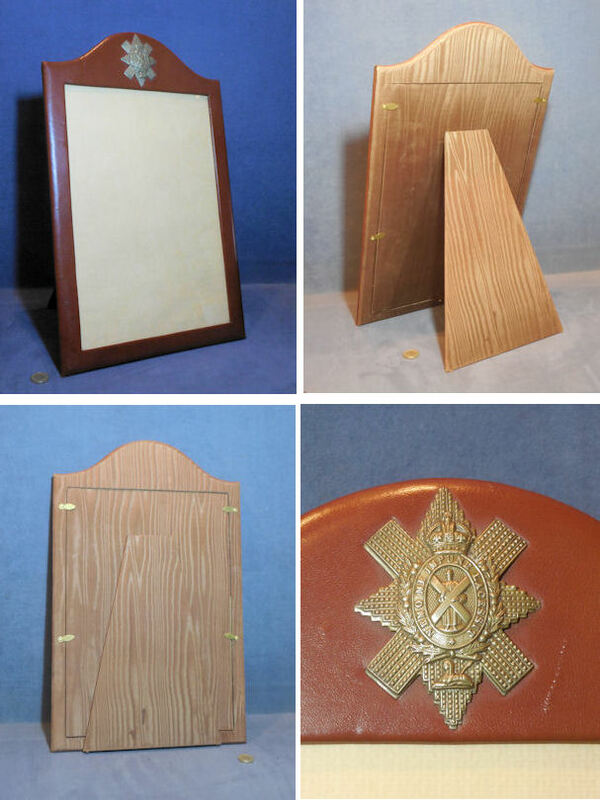 Original, quality pre war superb brown leather covered photo frame with an easel type back stand and a shot silk covering to the reverse. The back will remove by turning the clips to gain access to change a photograph. The front is mounted with a cap badge of the Scottish Black Watch Regiment and apart from a couple of minor scratches to the leather front, all is complete and in good order. 18.75" tall x 11.75" wide, 8" front to back with stand open and 0.5" closed flat. Visible picture 14" x 9.5". 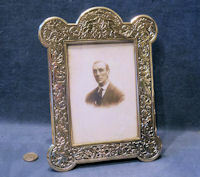 Original, quality late 19th century cast brass photograph frame, with a fold flat easel style back stand. This super example has a wide border frame, with an embossed design overall of mythical birds and beasts, with a pair of cherubs to the top. The easel and front of the frame has been polished and lacquered, although the lacquer may be removed at no extra cost but the reverse has the old patina and unpolished finish. Access to the rear to change the glass photo is gained by five turning tabs and will take a photo 6" x 4.25" , with 5.75" x 4" visible from the front. Total 9.25" x 7" x 0.5" front to back. Original, quality, late 19th century, photograph frame with a deep relief decoration of cherubs and putti in various poses on plants and vines, surrounding the glazed area. This frame wil take standard cabinet sized photographs. The top of the frame has a hanging loop in the form of a ribbon swag and the reverse has a folding easel stand. The main frame is in cast spelter with the original brass coloured finish and in superb detail and condition and complete and in good order. The best spelter frame we have seen. 11.5" tall, 9.25" wide at base, 1" front to back folded flat and 5.5" front to back standing. 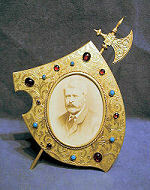 Original quality, late 19th century, heavy brass photograph frame in the form of a battle axe and shield. The shield is engraved with acanthus leaves and is mounted with coloured stones of various sizes in red and turquoise. A replacement glass panel and back insert have been made to suit and all is supported by the hinged easel backstand. In the original matt gilt finish. Has been lacquered and is complete and in good order. 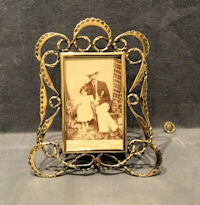 Size of frame 11" x 8" and photo view size 5" x 3.75".